Two songs : for voice and viola (or voice, violin and viola), opus 76a / Geoffrey Allen. Includes parts for viola, and for both viola and violin for the alternate version. Score & Part: Two songs for baritone, viola and cello, opus 76b / Geoffrey Allen. 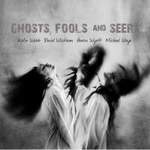 CD: Ghosts, fools and seers / Katja Webb, David Wickham, Aaron Wyatt, Michael Waye.